All hardware configuration is done from the administration interface. Changes to the configuration are automatically synced to the relevant controllers. Locking schedules determine when a door should be locked, double-locked (assuming it has two locks) or unlocked. The administrator can easily remote open any door. It is also possible to temporarily override the locking schedule. The Telcred Entry app for iOS and Android can be used to open doors as an alternative or complement to cards and readers. It can also be used to let a visitor in from a distance. For temporary visitors, the administrator can create either a PIN code or a URL (web link) that will open one or more doors during a specified time interval. The URL can be sent to the visitors in a normal email. Delegation enables e.g. tenants in an office building to manage their own users and access rights. At the same time it is possible to create access rights to shared doors, such as the main entrance. The event log displays everything that happens in the system in near real-time. Events can be sorted and filtered on different attributes, such as type of event, door, and user. Notifications can be created for many different event types. Notifications can be restricted in time (e.g. only during office hours) and sent to multiple receivers via sms, mail, or webhook. Through the well-documented API it is possible to do everything that can be done in the web-based management interface, as well as to retrieve all the information in the system. Today, Telcred supports door controllers from Axis Communications. 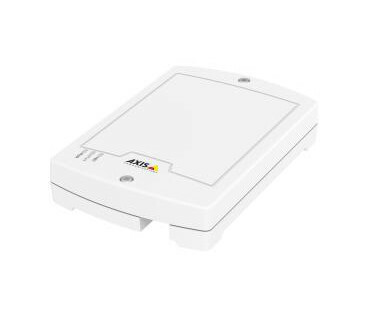 Axis door controllers support a wide range of readers that can be connected with either OSDP (Open Supervised Device Protocol) or Wiegand. They can be powered over Ethernet (PoE) and connected simply and securely to the Telcred service through a technology called O3C (One Click Connection Component) developed by Axis. In the future, Telcred will support open, IP-based door controllers also from other suppliers, when they become available in the market. The A1001 Network Door Controller supports one or two readers, a door monitor, REX (Request to Exit) device, and two electric locks. It can be used to control one door with two readers and two locks, or two doors with one reader and one lock each. More information about Axis A1001 can be found here. The A1601 Network Door Controller is the big brother to the A1001. It supports the same number of readers and locks, but has more memory and a more powerful processor, which makes it the preferred choice in installations with more than 400 users (the A1601 can store up to 70 000 credentials). It can also power 24V locks directly from the unit. More information about Axis A1601 can be found here. The A9161 is actually not a full door controller with local storage of credentials and support for readers. Instead, it is a “smart relay” that can be connected to the Telcred service using the same O3C technology as the A1001 and A1601 door controllers. It is space- and cost-effective solution for applications where a reader is not necessary, but instead all door openings are done through Telcred’s smartphone app or visitor URL. More information about Axis A9161 can be found here. There are two open standards for connecting an access control reader to a door controller: Wiegand and OSDP (Open Supervised Device Protocol). Axis door controllers support both of these standards. Wiegand has been around for a long time and is still common in some markets. OSDP is relatively new, but is already supported by a large number of reader manufacturers, e.g. HID, Assa Abloy, Nedap, Nexus, and Idesco. If there is a choice, we recommend OSDP readers due to more functionality and better security. Any credential technology that is supported by the reader can be used together with Axis door controllers and Telcred Access Manager. Configuration of the reader for a specific credential type, e.g. Mifare DESFire or HID iCLass, is outside the scope of Telcred Access Manager, so needs to be done using a configuration tool provided by the reader manufacturer or reseller. In recent years, wireless, battery operated locking systems have become quite popular. They offer a cost-effective way of extending the access control system to doors that do not have electric locks. Telcred Access Manager and Axis door controllers support two such locking systems: SimonsVoss SmartIntego and Assa Aperio. Just as with regular access control readers, configuration of the wireless locks for a specific credential technology must be done outside of Telcred Access Manager using tools provided by either the manufacturer or the reseller. SimonsVoss products are well known for their excellent finish and long battery operating times (up to 5 years and 80 000 activations). 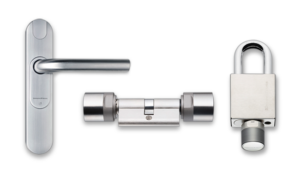 The SmartIntego product line from contains a digital cylinder, a “smarthandle”, and a padlock. These connect to the Axis door controller via a “gateway node” or hub. One gateway node can handle up to 16 wireless lock units and connects to the door controller over IP. The range of the wireless network is 20 – 30m with free line of sight. More information about SmartIntego can be found here. The Aperio product line contains similar wireless locks as SimonsVoss SmartIntego, including digital cylinders and door blade readers. 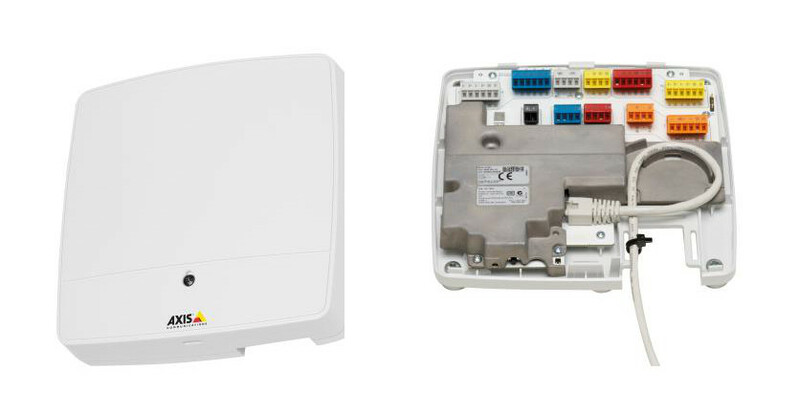 One difference is how the hub connects to the Axis door controller: in the case of Assa Aperio this is done via RS485 cable and using one of the two reader connections on the door controller (as opposed to IP for SmartIntego). Another difference is that an Assa Aperio hub can connect up to eight lock units (as opposed to 16 for SmartIntego). More information about Assa Aperio can be found here.